The Right-Wing anti-Muslim loonocracy and its minions in the blogosphere have secured a new cause to rally around, ironically enough it once again involves a Muslim minor, and in this regard, the anti-Muslim blogosphere really doesn’t have a good track record. As recent history has proved, the last time the anti-Muslim blogosphere got this riled up about Muslim minors they turned up with egg on their faces. Dozens, and I mean dozens, of websites took the video of the event and wrote lurid stories about Hamas mass paedophilia with headlines about ‘450 child brides’, and endless copy about how disgusting this was, how it showed how depraved Islam is, et al, ad infinitum. Site after site jumped on the story, linking from one totally wrong load of rubbish to the next. 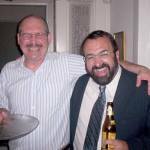 Robert Spencer was amongst the bloggers that falsely reported the incident as an instance of pedophilia. This time the case involves 17 year old Fatimah Rifqa Bary the daughter of Sri Lankan immigrants who came to America in 2000 seeking treatment for her vision problems. And before you could say “expediency,” the typical hordes of vultures started cycling, not so much out of interest for the girl’s welfare or the facts of the story, but as what they saw as a golden opportunity to reaffirm their caricature of Islam and Muslims as a dangerous cancer lurking within an otherwise good and pure Western civilization. With Lorenz holding his arm tightly around her, Rifqa told WFTV-TV in Florida on Monday that she would be killed if she came home. “We love her, we want her back, she is free to practice her religion, whatever she believes in, that’s OK,” her father, Mohamed Bary, said yesterday. “What these people are trying to do is not right — I don’t think any religion will teach to separate the kids from their parents,” he said. My position on apostasy has been expressed as early as 1983, namely that at the time of the Prophet it was not considered as only changing one’s mind but that it was the equivalent of joining the enemy and thus constituting high treason. In fact, at one time the Prophet had an agreement with the people in Makkah to return to Makkah all those who came from there, who wished to return after they had converted to Islam. I and a number of other distinguished Muslim scholars have long criticized the views of the four traditional Sunni schools…It is amazing to me how apparently little good faith and intellectual honesty you are displaying in your attack upon Islam and Muslims. If she is sent back to her family, she could be killed, in accord with the death penalty that is prescribed by all Muslim sects and schools for those who leave Islam. Those who believe, then reject Faith, then believe (again) and (again) reject Faith, and go on increasing in Unbelief,- God will not forgive them nor guide them on the Way. How would it be possible to reject faith twice or go on increasing in unbelief if one was suppose to have been killed after the first rejection? Furthermore, what purpose would withholding guidance have if the person had a death sentence anyway? The prescribed penalties are generally not suspended because of repentance, especially when they are reported and become known to the head of state. The punishment of highway robbery, for instance, is not suspended because of repentance; it is suspended only by the return of property to the owner prior to arrest. … Renunciation of the faith and conversion to disbelief is admittedly the greatest of offenses, yet it is a matter between man and his Creator, and its punishment is postponed to the day of judgment. Punishments that are enforced in this life are those which protect the people’s interests, such as just retaliation, which is designed to protect life. I have been criticized about this in many countries. My view is the same as that of Sufyan Al-Thawri, an 8th-century scholar of Islam, who argued that the Koran does not prescribe death for someone because he or she is changing religion. Neither did the Prophet himself ever perform such an act. Many around the Prophet changed religions. But he never did anything against them. There was an early Muslim, Ubaydallah ibn Jahsh, who went with the first emigrants from Mecca to Abyssinia. He converted to Christianity and stayed, but remained close to Muslims. He divorced his wife, but he was not killed. I know this is probably still not enough for you, so here are over a hundred more Islamic scholars who are against the death penalty for apostasy. Of course, this doesn’t mean that this girl (or many others who are in similar situations) isn’t at serious risk. She very may well be. All it means is that the straw man version of Islam that you have created only serves to ignite more hatred and promote your own personal ideological agenda. This highlights the absurdity that is Robert Spencer, an absurdity that projects an ominous pre-set conclusion on any heated situation that arises dealing with Muslims and castigates “all Islam” in the process without acknowledging the polyvalent interpretations that exist or the context. What further makes the Fatimah Rifqah Bary case one which exposes Spencer and his cronies is the hypocrisy of it all. This is being painted as a freedom of religion case, specifically the freedom to change one’s religion, but it seems in this department Spencer sounds like the pot calling the kettle black since he supports those who would restrict the freedom of religion of Muslims. As we have written on extensively before, one of the close comrades of Spencer is neo-fascist European politician Geert Wilders. Spencer is on the record stating his admiration for Wilders who he sees as the only European politician standing up for Western Civilization. 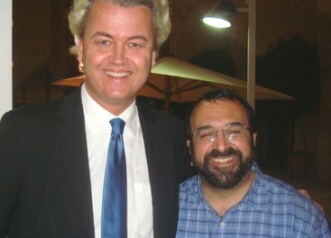 Wilders is by all accounts an odious individual who calls for the out right denial of religious freedom to Muslims. He has called for the banning of the Quran which he compares to Adolf Hitler’s Mein Kampf, he has also stated that, “Freedom of Religion should not apply to Islam.” He is also working to end Muslim immigration and strip Muslims in Dutch society of their citizenship. I didn’t actually have anything to do with that conference in Florida, but Hoop could just say straight out that I support Wilders. And so should anyone who holds dear the Western values that are threatened by Islamic supremacists. So is the Fatimah Rifqah Bary case another instance of Robert Spencer jumping the gun or is her life legitimately under threat? The courts will resolve that question, but Spencer has shot his credibility in this department with a track record of obfuscation, innuendo and misrepresentation and is wholly unreliable. Will Spencer also back track on his position that “all Muslim sects and schools of thought” legislates the death penalty for apostates and concede that there is a valid counter opinion such as the one articulated by Professor Bassiouni? Finally, will Spencer quit the charade that he is a democrat that cares for Freedom of Religion when in fact his position is to support those who would deny religious freedom? It seems that per his practice, Spencer seized on this case to further his well-oiled agenda that Islam is evil and Muslims are backward. As the story of Fatimah Rifqah Bary plays out we will see more clearly that the anti-Muslims are not motivated by her welfare but rather to confirm their warped hatred of Islam and Muslims. This would all be funny if it were not for the fact that people on both sides of this issue believe in fairy tales! You have fanatical Christians that will pull a babe from here mother’s arms because they are so desperate to evangelize. You have crazy Muslims that are even more fanatical and lets not ignore the fact that honor killings in Muslim families have happened here in the United States recently. Remember the guy who ran over his daughter. I think you are all idiots! Christians you cannot define the world with the book of Revelations. Muslims just quit being so scary! Religion is mainly about your culture and nothing more. This poor girl is going to loose her community ties that she knows from birth and never quite feel comfortable in her new community. It may feel great as a young woman but as she ages she will miss her ties to her Islamic community. This pastor at the Global Revolution Church is crazy to even be involved in this case. He should have sent her home to her parents when she showed up and told her to come back when she was 18 if she still wanted to convert.